Stand-alone surface (or optional pendant mount), single lamp. Integral 120/277V, 50/60 Hz universal ballasts. Direct/indirect square trim with white louvers (Trim 20). Material: cast zinc aluminum alloy and aluminum extrusion, matte anodized finish. Size: 2, 3, or 4 ft. lengths. 1 3/4" Xicato XTM LED Directional Pinhole Light Versen: Kurt Versen Co.
4" Round Fortimo SLM LED Very Narrow Directional/Accent Versen: Kurt Versen Co.
3" Square Xicato XTM LED Install From Below Downlights Versen: Kurt Versen Co.
4" Round Xicato XTM LED Downlights with Lens Versen: Kurt Versen Co.
Delray Lighting Inc. products feature CFL, T5/T5HO T8, LED, and CMH light sources in energy-efficient luminaires. Combined with the best power factor ballasts and drivers for standard and dimming applications, Delray fixtures ensure the lowest wattage consumption per square foot. 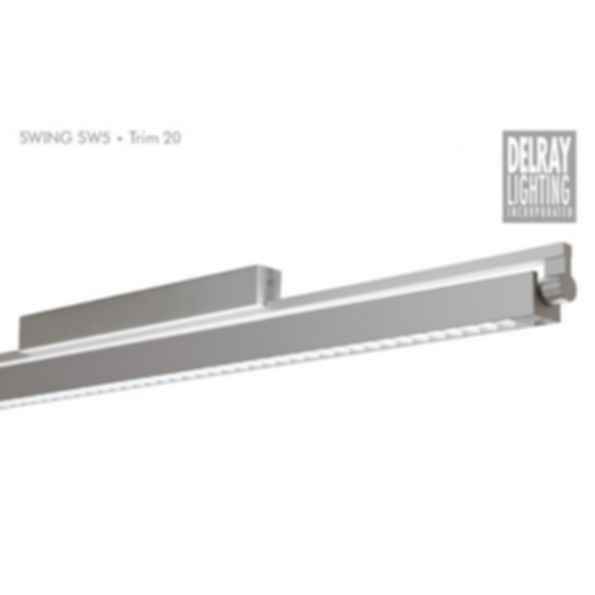 Most Delray products are offered with multiple dimming options to accommodate basic scene control, or energy management strategies like daylight harvesting, programmable/addressable switching, and step dimming. Delray utilizes postindustrial and consumer recycled content whenever possible, and complies with the highest State of California fabrication process standards for air and water quality management. Its manufacturing facility exceeds Title 24 building codes. In business since 1991, Delray is located in Burbank, California, and distributes through a network of regional sales representatives located in nearly all 50 states, plus Canada.